My, my! It has been a while since we have posted anything, but much has happened at the GW Apiary since our last updates. About three weeks ago, Senior Beekeeper Mehreen, Junior Beekeeper Liam and I heard from Tara, one of our researchers on the queen team, that Hive 7 was not doing well, so the three of us headed up to the apiary roof to assess the situation. As it turns out, Hive 7 was as healthy as ever, with plenty of brood, pollen, and young bees. We even extracted an entire super’s worth of honey and nectar! Not wanting to discredit Tara’s concerns, we inspected Hive 6 and immediately realized that something was wrong. All of the supers weighed little, there weren’t too many bees around, and there wasn’t much honey to extract. Each cell in each frame of Hive 6 contained tiny white specks, which we identified as evidence of a wax moth infestation. For those who are unaware, wax moths are pests that lay eggs in beehives after dark, and essentially infest the hive, eating many of the honeybees’ food sources (e.g. honey, pollen, even wax), and leaving practically irremovable webs behind. Earlier this summer Mehreen, Liam, researcher Pri and I scraped wax moth debris off of extra supers in our research building’s basement, and we got to know the little creatures up close and personal. This time around, Mehreen, Liam and I got an opportunity to see their destruction to a live hive. Although we’ve encountered the wax moths before, it was still a bit upsetting to see their detrimental impact on one of our most flourishing hives in our apiary. We could not get in contact with Professor Doebel, who had left for the day, so we decided to not take any drastic measures. We decided and were excited to inspect Hive 12 to see what it had to offer, since we were able to reap a whole bounty of honey from it just a couple of weeks ago. We were disappointed, since Hive 12 went from a healthy colony to a collapsed one in just a matter of weeks. There were cells full of pollen and half of a super’s worth of honey. There was no queen, nor were there workers or drones. Fresh, young bees were not fed enough to exert the energy needed to emerge from their cells, so they lifelessly hung limply from the frames, forever long and lost. Our Hive 12 is a classic, textbook demonstration of Colony Collapse Disorder, in which a healthy honeybee hive . This is not the first time a hive has collapsed at the GW Apiary, nor was this the first time our Hive 12 collapsed: this is the second consecutive year that our Hive 12 has suffered. Colony Collapse Disorder, or CCD, is especially frustrating since there is no single confirmed cause since CCD was first diagnosed in 2006. While strong correlation has been made in many scientific studies to various sources of destruction for honeybees, including pesticide use, Varroa destructor mites, stress, and more. It is one thing to beekeep, but witnessing the deterioration of Hive 12 serves as a grim reminder of why we are all involved in the GW Apiary and honeybee research lab: to make strides towards diminishing the impact of (and even resolving) Colony Collapse Disorder. If you’d like to learn more about Colony Collapse Disorder, but without being inundated with information or heavily scientific publications, I highly suggest watching this YouTube video, as it does a good job of summing up CCD with some appealing animation. Please keep checking back for more updates (including pictures!) 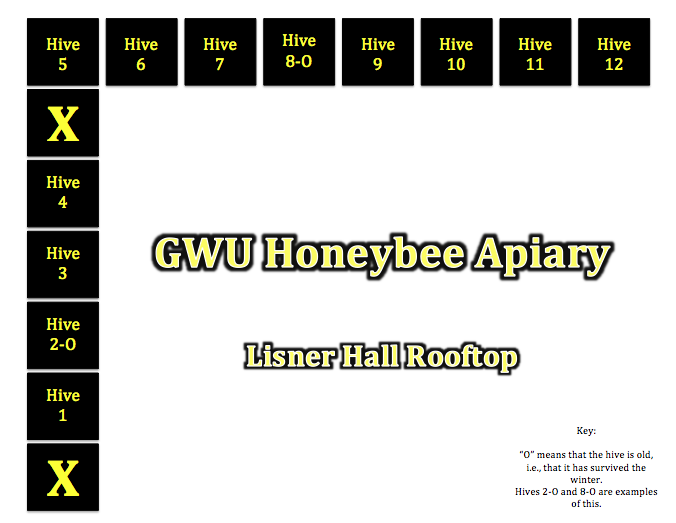 from some of our most recent developments, including part one of our honey extraction, which occurred during GW’s Alumni Weekend 2015, approximately two weeks ago. So stay tuned, and have a hap-bee Monday evening.